Last November, I proposed that for this Summer’s world Cup Altitude will be key, the thinner air in Johannesburg will cause the ball to behave significantly differently than at sea level. Less air resistance means faster shots and straighter trajectories. As part of a feature for the New Scientist (p35-37, June 5th 2010) we created a shot simulator to show how the same shot behaves at different altitudes. I also studied matches played by Mexico in the FIFA World Cup preliminary rounds leading to the current Finals, including home games at Mexico City at an altitude of 2,200 m.
Fig 1. 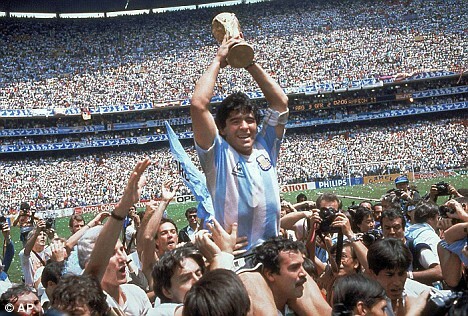 Maradona lifts the World Cup in Mexico’s Azteca Stadium in 1986. The raw data, provided by Prozone, comes from the analysis of synchronised high definition video cameras at each game. Eight World Cup Preliminary matches involving Mexico were analysed (Table 1) and the venues categorized using FIFA’s definitions as near sea-level (0-500m), low altitude (500-2,000m) and moderate altitude (2,000-3,000m). Although the data set is quite small (and one must always be careful about using small numbers to make big conclusions), there are some interesting trends. Table 1. FIFA qualifying matches involving Mexico. Figure 2 shows that shots from outside the box increase from just less than 5 per game at sea level to over 7 per game at moderate altitude. Conversely, the number of shots from inside the box seems to decrease. This is translated directly into the number of shots on target, with more from outside the box than inside the box. The implication is, therefore, that players playing at altitude might be more inclined to take shots from longer distance to take advantage of the straighter, faster trajectories. Whether this results in more goals is difficult to say as there isn’t really enough data in this data set, so I’ve stopped here. Figure 2. The effect of altitude on shots from inside and outside the box during 8 FIFA World Cup qualifying games (data courtesy of Prozone). The consequences for the World Cup Finals in South Africa will be interesting to see. Will there be more shots from outside the area in Johannesburg? The ball bends less and flies faster at altitude for a given kick, so shots will tend to be straighter and faster. Will players go for curling shots or straight shots? Will the goalies complain? One thing that seems quite certain, though, is that adidas has done its utmost to produce the most engineered ball for any World Cup so far (see the video below to see how a ball is made). The ball is constructed from eight 3D panels and thermally bonded together around an internal bladder. Their tests show that the ball should fly relatively straight when it has little or no spin, a ‘wobbly’ ball is something that goalies in particular have complained of in the past. Most importantly, the ball will be consistent so any odd occurrences should be due to the player or environmental factors. So, after the pomp of the opening ceremony on June 11th has subsided, sit back to enjoy the first game between South Africa v Mexico, two teams who should have significant experience of the effects of altitude on play. Let’s see how the players react and if they really do go for shots from distance. Note: Steve Haake acts as a consultant for adidas. Very interesting results Steve (Table 1). Although, the critic could argue that Mexico simply play better at home. Your are quite right to think critically. All teams play better at home with good teams winning > 50% of their home games (this doesn’t mean that you lose 50% as you can also draw). Of course what is needed is a large amount of data with a good range of altitudes to give good statistical significance. I just read your very interesting theory above and thought I should get in touch. I wrote a paper ‘ADV theory’ in late December/Early January on a related subject of altitude at the World Cup, however combined crucially with the distance teams had to travel in the group stages. The main argument was teams that were basing their training facilities at sea level, despite having games at altitude such as France would struggle, when also faced with significant transportation issues. The main reason for writing the paper was to find ‘value’ in the ante-post World Cup betting markets not as a scientific study such as yours, but I would be deligted to send it to you should you extract some merit in the findings. So far, I have only been sending to Football journalists such as Gabrielle Marcotti but would welcome the chance to gain feedback from the academic community. Blogging Professors: Big Boffins with Blogs « O'Really? What about designing the ball to compensate for the effects of high altitude on aerodynamics? Tennis has a specific type of (lower-bouncing) ball for use above 1,219 m.
Increasing the drag coefficient of the ball would make its behaviour closer to that at sea-level, to which most players are accustomed. It is not limited by FIFA, and could possibly be achieved by increasing the surface roughness. I don’t have any statistical evidence, but my guess is that the success rate of crosses, aerial passes and free-kicks during the first week of the World Cup has been lower than it might have been had all games been played at near-sea-level. Looking at Simon’s article it is possible that the Jabulani might be slower for many kicks rather than faster – it is only for ball speeds over 45 mph that the Jabulani has a lower drag force than the Teamgeist. Since the ball at the World Cup is (I hope) pumped up in site then the internal pressure of the ball ought to be gauge pressure which would be the same at sea level. Of course, there is a chance that some footballs pumped up at sea level could have made it up to altitude and are particularly bouncy! Top Ten Excuses for World Cup Losers (with citations) « O'Really? ← What’s wrong at Wembley?